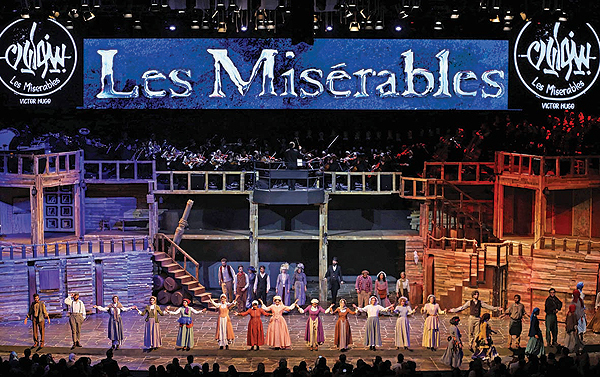 Iranian theatre director Hossein Parsaee calls Victor Hugo’s classic a “masterpiece without borders” but his groundbreaking production of “Les Miserables” that has hit the stage in Tehran has a few unique twists. For a start, none of the actresses are allowed to reveal their own hair, and in case their wigs look too natural, the poster advertising the show carries a bright red notice underscoring that their locks are fake. Nor do the actors and actresses touch hands, or have any other physical contact throughout the musical. This is, after all, the capital of the Islamic republic, even if the blockbuster show in the luxurious Espinas Hotel feels a world away from the usual stereotypes about Iran. The concessions to the government’s view of Islamic rules are often subtle. There is, for instance, always at least one other voice accompanying an actress when she sings-since female solos are taboo-although spotting the second voice can be tricky. All the other staples of a big-budget musical are here: a live orchestra, billowing dry ice and dazzling light displays. With a cast, crew and orchestra of over 450, the production has played to sold-out 2,500-strong crowds for six nights a week since it debuted in November. It was a mainly young, well-heeled crowd when AFP visited recently, and they could barely control their excitement at a rare chance to attend a musical in their home city. “It was so much more than I expected,” gushed Maryam Taheri, a 45-year-old housewife, after the show. “The acting, the music, the lighting-it was all perfect.” Foreign-made TV, film and cartoon versions of “Les Miserables”-a French 19th-century epic on sociopolitical tumult, crime and punishment-have been frequently shown in Iran, where the book has also been translated. The play has come at a volatile moment in Iran, when anger at economic inequality and corruption dominates political debate. Tickets, priced between 500,000 and 1.85 million rials (roughly $5 to $20, 4.4 euros to 17.5 euros), are beyond the means of most Iranians. “No Miserables allowed in,” said a conservative daily, Javan.